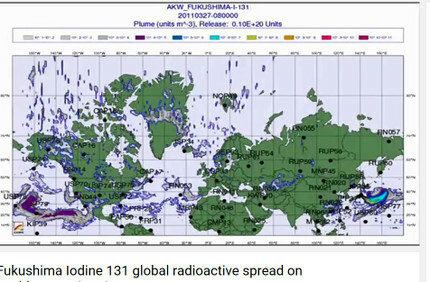 〔★は大沼〕　◎　Bobby1's Blog　31 times as much Iodine-129 than I-131 from Fukushima. ・　A recent article published in the Geochemical Journal (available here) by Miyake et al. 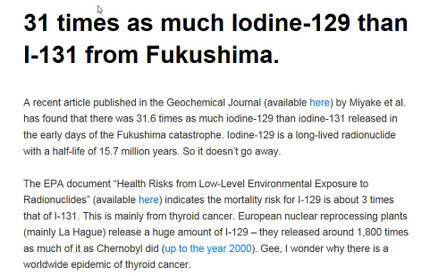 has found that there was 31.6 times as much iodine-129 than iodine-131 released in the early days of the Fukushima catastrophe. Iodine-129 is a long-lived radionuclide with a half-life of 15.7 million years. So it doesn’t go away. The EPA document “Health Risks from Low-Level Environmental Exposure to Radionuclides” (available here) indicates the mortality risk for I-129 is about 3 times that of I-131. This is mainly from thyroid cancer.